What is Clomicalm (clomipramine hydrochloride)? Clomicalm (clomipramine) is used to treat separation anxiety in dogs in connection with behavior modification and training. This medication affects chemicals in the brain that may become unbalanced leading to behavioral problems in dogs. Clomicalm requires a prescription from your veterinarian. Clomicalm (clomipramine) is a tricyclic antidepressant that affects chemicals in the brain (serotonin) that may become unbalanced leading to behavioral problems in dogs. Clomicalm treats separation anxiety in dogs. Separation anxiety is, in many cases, the root cause of behaviors such as excessive barking, inappropriate elimination, and other destructive tendencies. When used in conjunction with a training program, Clomicalm may be used to help decrease or eliminate these behaviors by helping treat the root cause. Don't use Clomicalm if your pet is taking a monoamine oxidase inhibitor (MAOI) such as Anipryl, or selegiline, or has been using a Preventic Collar in the last 14 days. Do not use in dogs with a known hypersensitivity to clomipramine or other tricyclic antidepressants, or in breeding male dogs. Clomicalm may increase the effects of other drugs and may cause drowsiness. Stop giving your pet Clomicalm and contact your vet if your pet displays any of the following reactions: difficulty breathing, hives, irregular heartbeat, difficulty urinating, seizures, fever with increased panting, muscle stiffness or weakness, or swelling of the lips, tongue, or face. Not for use in humans. In case of accidental ingestion, which can have serious consequences, seek medical help immediately. There is no specific antidote for clomipramine. People with known hypersensitivity to clomipramine should administer the product with caution. What is the most important thing I should know about Clomicalm? 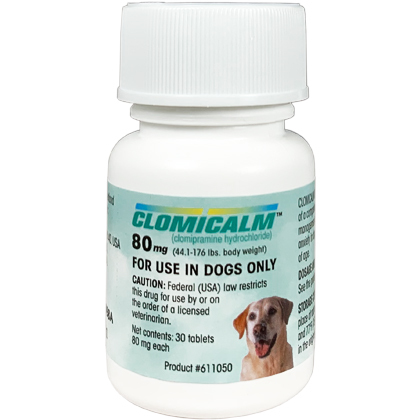 Clomicalm is a prescription medication FDA approved for veterinary use in dogs. Clomicalm is available as 20 mg, 40 mg and 80 mg tablets. The usual dose of Clomicalm in dogs is 0.5-1.5 mg/lb every 24 hours. Clomicalm may also be useful in cats, but cats tend to be more sensitive to tricyclic antidepressant drugs. Dosing of cats may be difficult with the commercially available products. Clomicalm may not help symptoms right away. It may take a number of days before symptoms begin to lessen. It is not recommended for behavior problems such as aggression. Other causes of inappropriate behavior unrelated to separation anxiety should be ruled out before prescribing. Contact your veterinarian if symptoms get worse or if new symptoms develop while your pet is on this medication. Clomicalm may cause drowsiness or dizziness. For complete safety information, see the product label. What should I discuss with my veterinarian before giving Clomicalm to my pet? Do not give this medication if your pet has taken or used a monoamine oxidase inhibitor (MAOI) such as selegiline, Mitaban Dip or Preventic Collar within the last 14 days. Tell your veterinarian if your pet has liver or kidney disease, asthma, thyroid disease, diabetes, stomach or intestinal problems, high blood pressure or heart disease, difficulty urinating, seizures, or glaucoma. Tell your veterinarian if your pet is pregnant or lactating. How should Clomicalm be given? Give this medication exactly as directed by your veterinarian. Allow your pet to drink plenty of water. If you do not understand the directions, ask your pharmacist or veterinarian to explain them to you. Store Clomicalm at room temperature away from moisture and heat. Keep this medication away from children and pets. What are the potential side effects of Clomicalm? If any of the following serious side effects occur, stop giving Clomicalm and seek emergency veterinary medical attention: an allergic reaction (difficulty breathing, swelling of the lips, tongue or face, or hives), seizures, a fast or irregular heartbeat, high blood pressure, difficulty urinating, fever with increased panting, muscle stiffness or muscle weakness. Other less serious side effects may occur. Continue giving Clomicalm and talk to your veterinarian if your pet has drowsiness or dizziness, dry mouth and eyes, constipation, panting, mild agitation, weakness or headache, nausea or loss of weight or appetite. Talk to your veterinarian about any side effect that seems unusual or bothersome to your pet. What happens if I miss giving a dose of Clomicalm? What happens if I overdose my pet on Clomicalm? If an overdose of Clomicalm is suspected, contact your veterinarian or emergency veterinary clinic immediately. What should I avoid while giving Clomicalm to my pet? Clomicalm may cause dizziness or drowsiness. Do not stop giving Clomicalm suddenly. This could cause symptoms such as nausea and malaise. Talk to your veterinarian or pharmacist before giving any prescription or over the counter medicines including herbal products. Do not give this medication if your pet has taken or used a monoamine oxidase inhibitor (MAOI) such as selegiline, Mitaban Dip or Preventic Collar within the last 14 days. Clomicalm may increase the effects of other drugs that may cause drowsiness, including other antidepressants, antihistamines, sedatives, pain relievers, anxiety medications, and muscle relaxants. Drugs other than those listed may also interact with Clomicalm. Caution is advised with concomitant use of anticholinergic or sympathomimetic drugs or other CNS-active drugs. 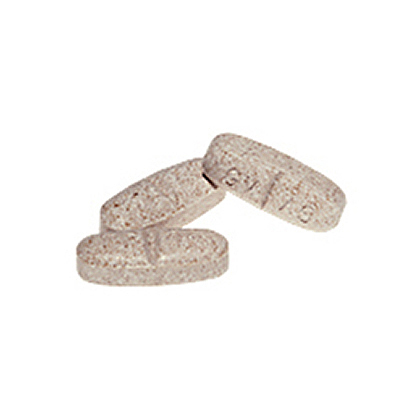 Clomicalm Tablets is a prescription medication used in dogs to treat separation anxiety. Clomicalm Tablets is not for cats. Clomicalm Tablets is classified as a tricyclic antidepressant. Clomicalm Tablets affect chemicals in the brain that may become unbalanced leading to behavioral problems in dogs. Clomicalm Tablets can be administered as a single daily dose or twice daily based on pets response. To minimize side effects, you may want to initiate treatment in divided doses. Clomicalm Tablets may not help alleviate symptoms right away. It may take a number of days before symptoms begin to lessen. Store Clomicalm Tablets at room temperature away from moisture and heat.